Chrysler introduced the 3 speed Torqueflite Transmission in 1956 with a cast iron case, The Aluminum case transmission we are familiar with today came out in 1960, with both the 904 Transmission (Torqueflite 6) for 6 cylinder cars and the 727 Transmission (Torqueflite 8) for V-8 cars and trucks. The first years until 1965 were push button shifted transmissions. 1988 Was the introduction of the A500 (42RH) Transmission and the A518 Transmission, The A500 transmission is a 904 with an overdrive unit on the rear and lock up converter clutch. The A518 (47RH) Transmission is a 727 transmission with an overdrive unit on the back with or without Lock up converter clutch. 1989 When Dodge put the Cummins Diesel engine in their trucks they first used the 3 speed Torqueflite 8 and then in 1991 they came out with the A618 (47RH)which is a 727 transmission with overdrive unit . The lock up converter wasn't available until model year 1994 with Dodge Cummins diesel trucks. 1994 (Jeep Grand Cherokee only) and 1996 with all rear drive Dodge Trucks and Vans we have the 40RE,42RE,44RE (A500) and the 46RE (A518) for gas engines and the 47RE for Diesel engines. The new change here is the addition of and electronic governor solenoid and transducer. Apparently the mechanical governor that lasted for 35 years or so just wasn't good enough to keep up with emissions and fuel mileage standards set forth by Uncle Sam. 2004: the final saga of renaming a transmission: 48RE Transmission for Dodge Cummins Diesel applications which is simply a 47RE with new design pump, torque converter and valve body modifications to combat TCC problems. To put it simply the Dodge Torqueflite transmissions have had some 46 years of service under several names but they all are basically the same Transmission and some of the parts from 1960 will fit a 2006 model year Transmission! There actually are a few more model designations but lets not clog your head too full of useless information, just remember these Transmissions are in any rear wheel drive Chrysler, Dodge and Plymouth car or truck, Jeeps, AMC products, International Scouts, Trucks, Street sweepers and industrial machinery from 1960 thru 2000 and beyond for allot of applications before being phased out in 2007. Includes Pressure testing, Dodge truck band adjustments, ratios, and applied elements. Complaint: Dodge Transmission wont shift/late 2-3 or unless foot lifted off throttle, flares or neutrals on shift. Dodge trans 2-3 shift flare or slip fix. Complaint: Dodge Governor pressure or transducer codes: P1762, P1763, P1764. 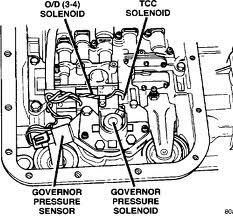 There are several issues that can cause Governor codes in Dodge vehicles, First and most common is simply either the governor solenoid is faulty and or the pressure transducer is faulty. However if you go to change these as you suspect they are bad or have tested and know are faulty and you remove the oil pan and its full of debris and or metal chips etc that's what may be clogging up your governor solenoid screens and or solenoid. replacing the solenoid and sensor will likely result in temporary fix. Governor and pressure transducer location. P1763 can Be set if your line pressure is too high, such as shift modification kit installed and or stuck regulator valve, stuck/frozen TV linkage from engine. If shift kit has been added you may need to kepp line pressure in drive at idle to between 90 and 95 psi. There is also some software updates on pre 99 vehicles to combat false code P1763. P1762,P1763,P1764 or no codes and transmission wont shift, shifts late, wrong gear starts: First check for any O2 sensor codes, the governor solenoid shares a ground with the heated O2 sensor ckt, repair as necessary any O2 codes/issues first. sometimes you may not have any O2 codes. a good test here can be to unplug all the O2 sensors and drive the truck, if you problem goes away or your codes then you've narrowed down your problem already. a lot of times its the O2 sensor itself is shorted and feeding volts back thru ground ckt. and driving the governor solenoid or sensor nuts. The best way to test governor and sensor operation is to use scan tool to watch commanded pressure and actual along with a gauge on the governor port of transmission, all should closely match and believe the gauge over actual on scanner. Complaint: Dodge truck/Jeep Engine stalls when coming to stop. Cause: This can be very abrupt! feels like side stepping clutch on manual in gear. Possible the converter clutch is stuck on or dragging. this can be due to several problems. one being the lock up solenoid is stuck or plugged with debris, again if pans full too changing solenoid wont cure issue for long! sometimes the solenoid can be loose on the valve body as well. This can also be caused by valve in valve body stuck in stroked position. On 46RE, 47RE and 48RE transmissions it could be caused by large cross leak in pump stator, this will usually however cause TCC shudder or no TCC, wiped out TCC clutch. On V-8 gas engines the crank sensor in lower right side of engine can be weak and engine will stall and feel like converter is stuck on and stalling engine but is actually bad crank sensor. this may or may not stall all the time or very intermittently. Complaint: Dodge No shift or late shifts, lazy or no speedometer, may have no codes. Cause: Either the output speed sensor is faulty or the rear differential ABS sensor is faulty. This can be very erratic, intermittent, etc. The computer uses both the ABS sensor reading along with the output speed sensor reading to calculate desired governor pressure and transmission shifting. these both can be monitored with a scan tool. Complaint: Dodge truck Transmission "hunts" in and out of lock up or 4th gear on steady cruise, poss. no codes. Cummins diesel or gas dodge trucks. jeeps. 1998 and up Cummins Diesel trucks have a APP instead of a TPS and can have yet another problem with the signal coming out of the ECM and or the wiring from ECM to the PCM causing same issue. Quick cheater repair : Jump additional wire into circuit H102. Cut the wire at circuit K22 at the PCM C1 connector, pin 23. Connect the jump wire from circuit H102 to pin 23 on PCM connector C1 and drive the truck to see if your problem is gone. Complaint: Dodge/Jeep Trouble code P1740 TCC slip /TCC stuck off. Cause: Code 1740 means that the TCM hasn't seen proper rpm drop when Converter clutch is commanded. Likely causes can be: Low fluid levels (check in neutral only) Torque converter clutch lining has failed, delaminated from inside converter, mechanical lock up solenoid failure, loose lock up solenoid to valve body bolts, Broken spring retainer on valve body, stuck valves, and on 46RE,47RE and 48RE transmissions the pump stator has cross leaks or the passage ball has fallen out. First and easiest to check is the fluid level, if low fill and road test etc. find the leak! Then you can remove valve body and check for loose bolts on solenoid, broken retainer on valve body. check for stuck valve (which would likely be due to heavy contamination so you may need an overhaul if this was the case). You can also air check solenoid operation with 12volt supply and air into solenoid. Tests. There's no good way to test converter clutch and if the last tests don't reveal anything then you need to remove transmission and replace the converter. on the 518,618,46RE,47RE and 48RE units you should remove pump, check that passage ball is still in place and not loose, and check surface of stator assembly because its commonly not flat and can be lapped with good sharpening stone by hand. Complaint: Dodge transmission, Found broken snap ring in oil pan during service. Cause: Likely the direct overdrive snap ring in rear housing is breaking. very common and this should be replaced during every overhaul. if transmission was working fine and pan is clean you can remove rear housing and replace this and leave rest of transmission in the truck. There's a huge spring that you need tool for, alignment shaft, and hydraulic press to disassemble and reassemble the overdrive unit. failure to use tools and press can result in injury to ones self and damaged parts. It can also be that band is wiped out. remove transmission pan and see if the parts is the picture are in your pan. if they are you have to remove valve body and replace any broken strut and reassemble. Tip: Sometimes also the band adjuster has also backed out of the case, see band adjustments under rebuilding information near bottom of page. Complaint: All shifts Are late/hard or wont shift at all, 1-2 shift only. Complaint: Leaking out of front of transmission. Cause: First thing to do here is verify your not overfull of transmission oil! the vent is inside of the bell housing on Dodge transmissions. this can occur if your changing out transmission and you overfill before starting engine etc and you may think you have a leak when you really dont. Retrieving trouble codes from Dodge/Jeep vehicles 1988-up. Complaint: No reverse and all forward gears good. Cause: usually this means the low/reverse band has broken. in some case and mostly in the 518,618,46RE,47RE and 48RE the rear band servo piston can crack or break, this can be fixed in the truck without removing transmission, pull pan off and see if band broken or piston is broken or cracked. Complaint: Cannot shift into park, or park wont hold, stuck in park. Cause: Common problem here can be that the direct overdrive snap ring has broken/cracked into pieces and is jammed in the parking Pawl mechanism. This can be repaired in the vehicle by removing the overdrive section from transmission and dislodging the broken snap ring parts, replace snap ring with new. (you need tool set and hydraulic press to disassemble the overdrive section once out of vehicle, large spring under load, do not attempt without tool set and proper press etc or injury may result)Check park rod ends for damage as well. Checking fluid level and correct fluid for Dodge transmissions. The Torqueflite transmission fluid needs to be checked in neutral only. checking in park will give false reading as will read higher than is, no converter flow in park on these. for any Dodge transmission with a lock up converter clutch you must use Chrysler ATF+4/7176 or you will have TCC shudder and or failures. if you have non lock up unit than you can use regular Dexron3 or equivalent. Complaint: Dodge A518, 618 and 500: no 4th or lock up. Cause: Check the fuse: 4th and lock up are computer controlled and 1-2-3 are hydraulic on pre 96 trucks. you can lose power to trans and will be just a three speed. On any of these units you can have no 4th or lock up due to loose solenoid bolt on valve body, leaking gasket, and or faulty solenoid. On earlier trucks you can have internally grounded neutral switch or shorted starter relay which will not allow 4th gear as TCM sees park or neutral all the time, simple test is does truck start in any gear? if so your switch, relay or Ckts are the problem. On older or high mileage vehicles you can have the seals on the overdrive piston shrink so much they wont seal in the bore and cause no 4th as well. this can be fixed by removing the overdrive housing and replacing the seals on the piston on rear of transmission. (or see first complaint for 2-3 shift problem and cheater repair with brake fluid, this may work here as well) Be sure to clean up bore as well from scratches. General rebuilding tips for Dodge truck and Jeep transmissions. First and foremost on these transmissions is REPLACE the bushings in the unit. they wear badly and can cause all kinds of troubles, check the ring bores due to worn bushings. the most important ones are the pump, direct drum and sun gear bushings. check sun gear for wear damage to teeth. very common on large unit to have fatigued/pitting gear teeth on rear of sun gear, replace as necessary. On 518,618,46RE,47RE and 48RE units flat stone the pump stator to alleviate TCC shudder and failures. Replace the top wave snap ring holding the direct overdrive clutch pack and spring together. its very common to break, always replace with new. Diesel Transmissions: if your front planetary in the transmission is aluminum ALWAYS upgrade to steel planetary package! it will strip out the inner splines or shatter with a diesel engine. good upgrade for any unit being used hard as well. Polish the inside of direct drum piston and install wider updated inner seal. also polish the inside seal bore areas of the overdrive aluminum housing same as direct. Always replace torque converter with quality remanufactured. Make sure you use the updated wider inner seal in the direct drum so you wont have the shrinking seal syndrome. Its good idea to replace the low reverse band if its the single wrap style as they like to break from fatigue, check the servo piston for cracks as well as the anchor struts in the 727,518,46RE units. Replace the governor solenoid and governor pressure transducer. these are high failure items. In rust belt states look at oil pan and if it has rust "Zits" all over get a new one so its not back leaking tomorrow. Check in the overdrive housing where the snap ring for the large bearing is in rear, sometimes the snap ring groove is worn out and will cause severe end play, housing will need to be replaced if worn. also check the bearing, it can go bad and makes loud noise driving. Custom Search for your trucks transmission parts needs.